This representation of the goddess Usnisavijaya, flanked by two assistant bodhisattvas carrying flywhisks, has three heads and eight hands holding her attributes. Her right-hand head is gilded; her left-hand one is blue and has a fierce expression; her central head, like her body, is white. Throughout the Himalayan and Chinese world, this deity appeared inside a stupa. Here, in the lower section, lions and the four guardian-kings (lokapala) of the four cardinal points are depicted. On either side of Usnisavijaya are medallions containing the seven treasures of the universal sovereign, and seven of the eight auspicious signs of Tibetan Buddhism. At the very bottom left appears the donor, in front of various offerings to the goddess. There is a substantial Nepalese influence, as shown by the small, ornamentally treated floral columns, the leafy arches, the red and blue ground embellished with monochrome foliation, or the jewels modelled on Newar creations from Kathmandu. On the other hand, the golden motifs on the central figure’s clothing, and the canon of the lokapala, all derive from China. This monumental painting -gouache on canvas, with sporadic golden highlights on the faces of the deity- has been executed with great finesse. The goddess Usnisavijaya, or “Victor of the Sinciput”, is particularly venerated by Nepalese and Tibetan Buddhists. She is believed to procure longevity, thus enabling the faithful to obtain greater merit and to ensure a more felicitous reincarnation. 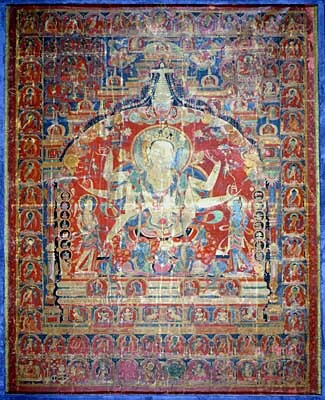 The work belongs to a sumptuous, eclectic style of art that developed in 14th century Tibet, at that time dominated by the Sa-skya-pa. During this period, the country was in charge of religious affairs throughout the Mongol Yuan empire (1279-1368) with which it maintained close relations that fostered cultural exchanges.